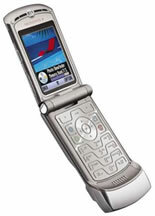 The Motorola Razr V3 is a feature packed, top of the range mobile which is unbelievably thin. 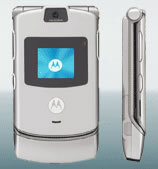 Below we have a review of features, or you can just view the best Motorola Razr V3 deals currently available. The showstopping looks of the Razr V3 are created by a sleek and strong anodised aluminium case, and an etched keypad that glows blue for a truly futuristic effect. With both external and internal colour screen, MPEG4 video playback, VGA digital camera, Bluetooth and WAP for internet browsing, it is incredible how much the Motorola Razr V3 manages to pack into a case that is so thin you won't even notice it in your pocket. What's more, the V3 is equipped with Quad-Band GSM, which means it's one of the most capable mobiles for getting a signal wherever you are in the world. Bands: GSM Quad-band (GSM850, GSM900, GSM1800 and GSM1900) for excellent worldwide capability, including North and South America. Digital Camera: Yes, VGA camera with 4x digital zoom. Takes 640 x 480 pixel pictures. Video Playback: Supports MPEG4 video playback. You can download video clips from your network's WAP site.